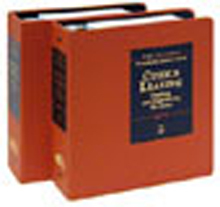 The Continuing Education of the Bar of California has published its October 2012 update to Office Leasing: Drafting and Negotiating the Lease. I have been honored to serve an update author for the past few years, along with a number of my law firm colleagues, who have served as both original and update authors. For this year’s update, I served as the update author for Chapter 19 – Alterations and Additions and Chapter 40 – Leasehold Improvement Agreement Exhibit. Thanks Neal. Duly noted and updated.